Three Big Questions to Change the World! Really? Three questions can change the world? Well, maybe. Let’s think about it for a minute. One thing we know about schools is that nothing stays the same for long. Each year brings the latest “best practice.” Each week brings a new procedure and its paperwork. Each day, our students pose new challenges. Each hour, the media bombards us with news about the latest crisis. What might possibly help us keep our balance as the world shifts beneath us? Clearly, no one is in absolute control of these changes. We cannot predict what is coming, and we have to admit that we have little control over how these changes will happen. To think about our options, let’s consider what scientists tell us about other turbulent and continually changing systems — systems like the weather, population growth, and the stock market. Although scientists and economists can see general patterns, they have come to realize that they can neither predict nor control individual actions in these complex adaptive systems. They also recognize that many of these unpredictable individual actions combine to generate coherent patterns across the whole system. Whether or not we like those patterns, they become a part of our reality. In classrooms, when the actions of individual students contribute to the pattern of the whole, we talk about the class taking on a life of its own. The actions of individual students and staff members contribute to patterns that we call the “campus culture.” So, in the face of continual change, how can we pay attention to these individual actions and the emerging patterns across the system to help us see some coherence and build some sense of balance? These are the three big questions that we can ask in the face of continual change—no matter where we stand, no matter what work we are doing. We can ask and answer those questions over and over again as we navigate the shifting landscape where we are working. the “exchanges” that are responsible for the transfer and transformation of energy and information throughout the system. Actually, the answers to these questions are less important than the conversations they trigger. Ongoing dialogue about these three questions is essential. It is not enough to find answers to these questions and then post them on the website for everyone to see. Multiple conversations triggered by these questions over time will help us see, understand, and influence learning and adaptation in our system(s). That is why these questions are the heart of professional learning communities. That is why these questions (however they might be worded) are embedded in the work of the inquiry groups on the Literacy in Learning Exchange. If we want to be ready to adapt in generative ways to constant change, we need to be asking and answering those three questions over and over again. Of course, our answers will change as the landscape around us changes, but the questions help us keep our balance as we move forward on this ever-changing path. Maybe the title of this post is not so crazy. Maybe we can use these three questions to change the world. Eoyang, G. H. (2002). Conditions for self-organizing in human systems (Doctoral dissertation, Union Institute & University, Cincinnati, Ohio, 2002). Eoyang, G. H. and Holladay, R. (2013). Adaptive Action: Leveraging uncertainty in your organization. Palo Alton, CA: Stanford University Press. Patterson, L., Holladay, R., and Eoyang, G. (2013). Radical rules for schools: Adaptive action for complex change. Circle Pines, MN: Human Systems Dynamics Institute Press. In human systems, uncertainty is our most constant companion. It is, in fact, our friend. To influence human systems (like learning in classrooms and schools), we have to expect things to be uncertain, unpredictable, surprising, and sometimes confusing. That is the way things are. The only constant is change, and the only sure thing is surprise. So how do we cope? How do we have any sense of influence over these unpredictable realities? Eoyang and Holladay (see reference below) say that we must embrace uncertainty. We must “leverage uncertainty” so that we can see options for action and set conditions for positive change. How do we do that? 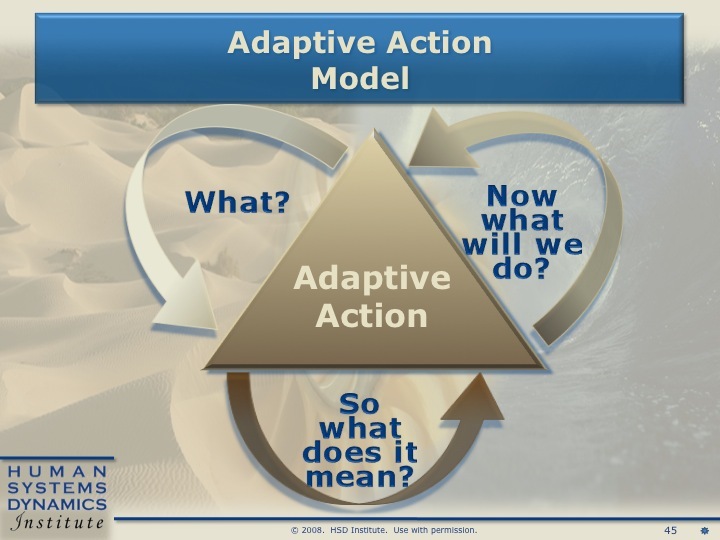 They recommend Adaptive Action–a cycle of observation, reflection, inquiry and action that can help us choose the best next step toward our goal. Now what shall we do next? Now what are our new questions? This inquiry/action cycle is at the heart of responsive teaching, and it should be at the heart of responsive school reform/transformation. This recursive cycle is “simply” a way to talk about teaching and learning that resonates with what many others have said over the years. It would sound familiar to John Dewey, Louise Rosenblatt, and Marie Clay. We have found these questions a simple and powerful way to talk about what can happen when we welcome uncertainty and move forward, even when the path is unclear. From Trees to Webs: Transformation Is About Changing How We Think! What do you think? True? Useful? For the last 12 months, I have been on an amazing learning journey with my colleagues at Human Systems Dynamics (HSD) and The Ball Foundation. Together, we have worked with some impressive educators in New Haven Unified School District (CA), to improve learning for all students in their district. We are now looking back on the year, trying to synthesize what we learned. Here’s my most important ah-ha to this point. Transforming schools is simply about learning. It’s about setting conditions that ensure that everyone learns, individually and together. We want to see kindergartners dive into new experiences, take risks, make guesses, ask questions, seek patterns, interpret their experiences, and share what they are learning. We want to see 12th graders ask significant questions, observe closely, read deeply, analyze issues thoroughly, draw conclusions, and create compelling reports and essays. That is precisely what teachers, educators, parents, and policy makers need to do if we are going to save public schools! There is no silver bullet–no program or policy that will transform schools. Forget Superman. What patterns do we notice in our system (both desirable and undesirable)? Where are the significant issues? What are the differences that make a difference? What are the tensions? Where are the questions? Where are the puzzles and anomalies? So what do these patterns say about our assumptions? our ideologies? our shared goals? our behaviors toward one another? our discourse? So what do these tensions and questions mean for our system, for individuals, and for the greater whole? Now what options for action might help us set conditions that amplify the patterns we want to see? or diminish the patterns that prove less useful? Now what are our new questions? And how can we tell our story to others? Once we take action, we begin the process again. Here is what some of our colleagues in that school district said about the power of Adaptive Action. These are teachers, instructional coaches, and administrators who are standing in inquiry, looking at patterns and trying to solve real problems. As a literacy coach, I think the biggest change for me has been just the idea of standing in inquiry and using adaptive action. . . . I really am now thinking through things and asking those questions. On my campus, we talk a lot about patterns and how, if we want to see a change, it has to be at all levels. So when you’re bringing a problem to the table, think about the what, so what, now what in terms of different levels because what might be an issue at your grade level, may also be an issue for the Instructional Leadership Team, or with all the elementary principals. So we’re not just looking at the issue at that one level but looking up and down and across the district. In my classroom, we were having a problem with partner talking so I sat with the class and I elicited a bunch of things that were happening — patterns that they saw. What are we noticing? It’s a pattern of a lack of respect for your partner so how can we change that? And my students came up with a few things that they wanted to try and change. Since then it’s been pretty good. We still have to go back and remind ourselves, but it’s been pretty good. These educators are showing us what happens when each individual throughout a system begins to focus on students, honestly makes sense of the patterns in the system, and generates options for acting individually and collectively to support student learning. We are beginning to see the potential for whole system transformation when individuals and groups throughout the system use Adaptive Action–in classrooms, hallways, cafeterias, teacher workrooms, parent conferences, and board meetings–to focus on their most pressing challenges. When everyone in the system is standing in inquiry, when everyone is learning, the dynamics shift. The system changes in a fundamental way. We simply ask questions, observe and interpret what we see, and, together, look for answers. Perhaps Adaptive Action is the “simple” path to saving our public schools. For more information about Human Systems Dynamics and Adaptive action see http://www.hsdinstitute.org.